Sarah Palin, John McCain and their Tea Party/Measuring Up brethren have been chanting 'Drill, baby, drill' for some time now. Wrapping themselves in the American flag, pro-drill Republicans say it's critical we plumb the oil reserves lying off the U.S. shoreline. To do otherwise, they argue, is to keep us held hostage by the Middle East oil cartel. But, at what price? The horrific BP oil rig spill in the Gulf of Mexico is just the latest example of what will happen if we continue to recklessly drill, baby, drill. Five billion barrels of oil are pouring daily into the Gulf's waters and slowly, but surely, making their way towards shore. The carnage to wildlife and pristine shorelines may be catastrophic (and, New Orleans may once again bear the brunt of the damage). 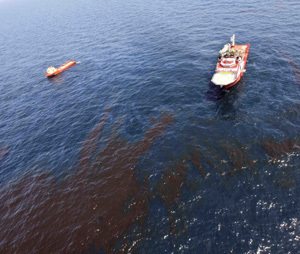 Making matters even worse, BP can't figure out how to cap the sunken oil rig's three separate leaks. Republicans paint domestic drilling opponents as unpatriotic tree huggers. Maybe so, but the more companies such as BP are given free reign to drill into America's continental shelf, the more we'll see environmental disasters like the one unfolding in the Gulf. It's time for even more significant investments in alternative energy sources such as nuclear, wind and solar. Nobody wants to be held hostage by the oil cartel, but right wing hawks like Ms. Palin need to wise up. Otherwise, her multiple children and grandchildren will not only be able to see Russia from their front porch, they'll be able to walk across an oil-caked Bering Sea to get there.